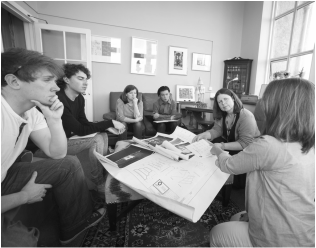 The Scenehouse Programme is the collective term for the full six weeks of study offered in Edinburgh, consisting of Scenehouse Make Scenehouse Paint Design 1 and Design 2. Students opting to take the full programme will gain several advantages: There is the cumulative benefit of studying each part of the programme in sequence, with the fresh learning from each week feeding into the next. Students will also enter a sustained period of professional contact in which complex ideas can be worked through and explored. The weekly group outings to see and discuss interesting work also become an ongoing discussion with a growing frame of reference. International students visiting Scotland will have sufficient time to fully experience its two main cities. The Programme dovetails with the Edinburgh Fringe Festival and the Edinburgh International Festival. This scheduling is ideal for those who wish to complete their studies by experiencing the largest cultural festival in the world, and the Programme includes visits to see some of the outstanding productions on offer at this time. To see examples of work from previous courses visit our gallery links page here.